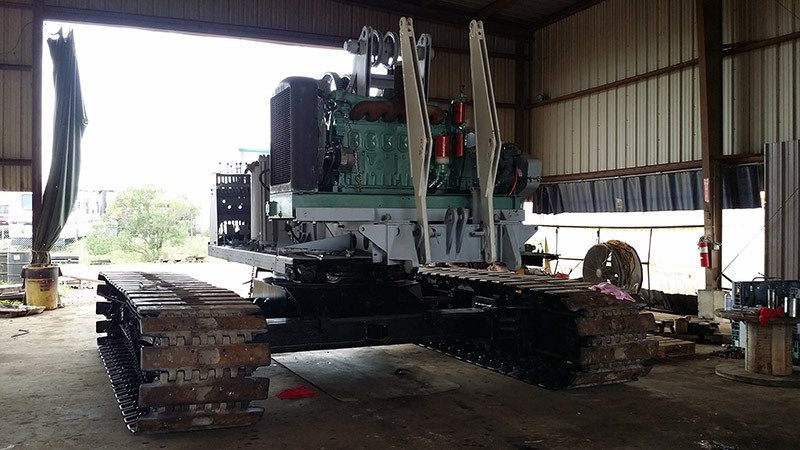 Whether you are looking for a complete crane overhaul or a modified rebuild which addresses your needs specifically, Mitchell Crane can build a reliable machine which will produce for you for years to come. Complete rebuilds start with a thorough inspection and some basic disassembly to determine current condition of a crane and whether there are potential issues which could render the crane unrepairable like a cracked or bent frame. Although there are very clear differences in cranes, many of the concepts concerning an overhaul are similar. Below is just a sample of things considered when addressing the rebuild of a crane and are not in anyway complete a rendering of all factors involved in the overhaul of a crane. Crane overhaul is a complex process and should only be performed by a qualified mechanic with the proper training, tools and resources. Clutches – Major functions, such as swing and hoist, of a conventional crane are controlled by air pressure or hydraulic pressure being delivered to an actuator which engages or disengages clutch frictions joined to the drive line of intended function. Brake Bands – In order to stop or slow a particular function once in motion, like swing or travel a brake is applied initially before a positive lock can be applied if available, some times a brake is not present and operators may only apply a positive lock on swing when machine is not in use. This set-up is mostly seen on duty-cycle machines. If bands have excessive pitting from rust or are misshaped we will replace the band with a new one or another good used band which has already been repaired. 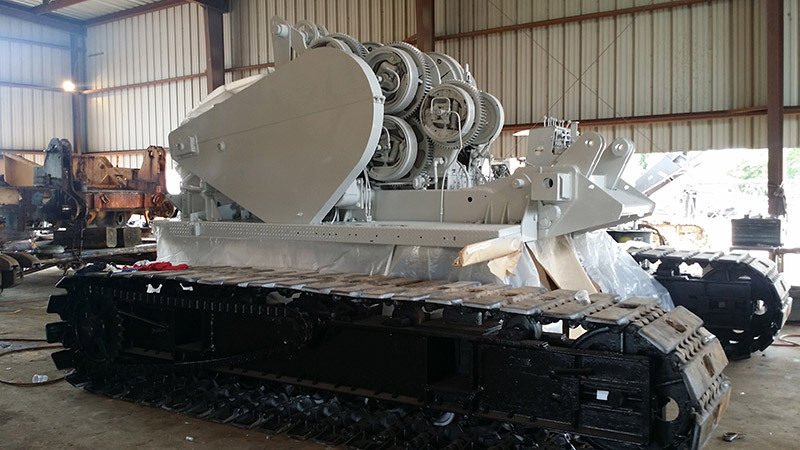 Hook Rollers and Load Rollers – Older conventional cranes use a series of hook rollers and load rollers to allow the upper revolving frame to rotate while securely attached to the lower car body. Proper fit is crucial because these rollers are key players in the stability of a crane during a lift. Travel – Crawler cranes run on tracks and these components take the weights and pressure not only of the load being lifted but of the entire machine as well. Proper maintenance is vital to the longevity of these components and typically they show the most wear. 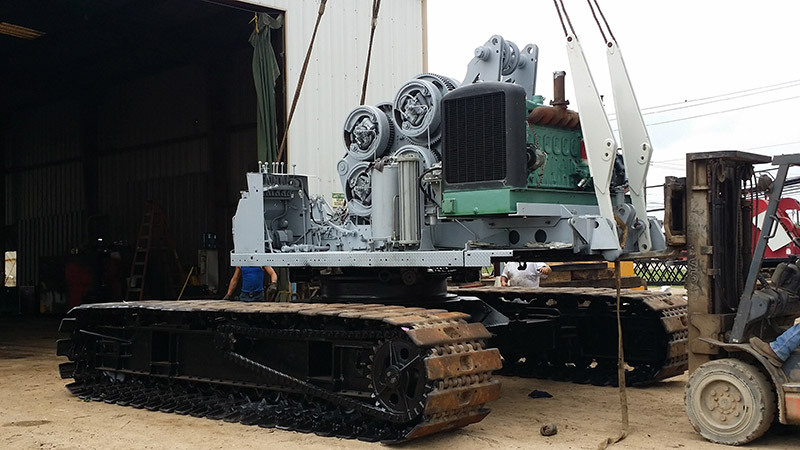 Unlike some other components of a crane, nearly everything on a side frame is safely reusable with a little time and effort put into their restoration. Side frames are stripped and all imperfections are repaired. Most of this repair is welding build-up of worn areas, hole cleaning and thread tapping. Gears and Shafts – The backbone of your crane, nearly every function will have a shaft or gear associated with it and proper fit and performance of all gears and shafts ensures safety and extends the life of the crane. Gantry Components – Perfect triangles and a combination of quality parts are key factors in a cranes ability to lift its maximum load safely, no short cuts should ever be permitted in crane repair, this is absolutely paramount when repairing gantry components. Operator Cabin – When competing for business a good looking machine can be a great advertisement and speaks to the quality of work you do. Boom – Suspended loads are only as safe as the boom holding them up. Boom repair is only done by qualified professionals and many factors are considered when repairing boom. 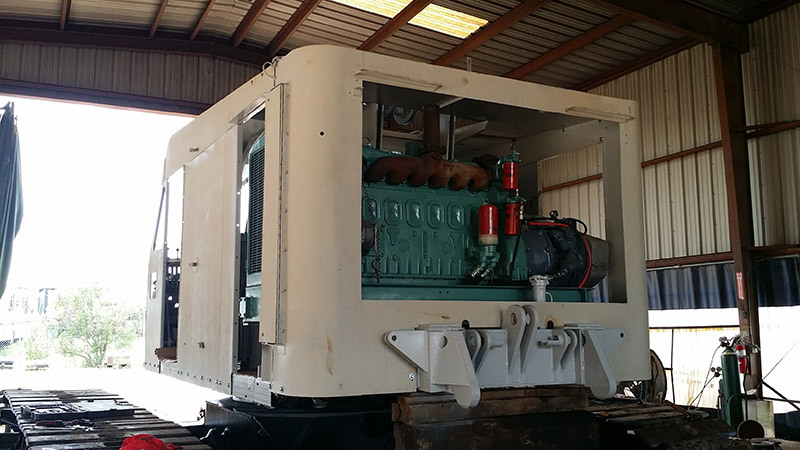 Power Plant – An engine is the driving force behind your crane and can be a regularly maintained component of your crane which never causes any problems or it can be a daily headache jeopardizing safety and impeding productivity.